In 1859, placer miners and prospectors in the western Great Basin made two remarkable strikes of gold and silver ore breaching a mountain's slope near Virginia City. It was the culmination of regional discoveries and excitement that began a decade before with the famed California Gold Rush of 1849. The 1859 discovery in the Great Basin provides an epilogue for the California Gold Rush. It was not so much the end of a story as it was an indication of how future mining would change an entire region. The Comstock Lode, as people soon called the ore body, was distinct in the ways that it influenced subsequent development in the American West. First, the Comstock Mining District quickly became home to deep underground, hardrock mining. Although some California operations had also taken this direction, the Comstock established approaches to technology, corporate investment, and community growth that were imitated internationally for the next 50 years. For example, the Comstock had a huge labor force of salaried professionals, breaking from the California pattern of thousands of independent mining entrepreneurs digging for themselves in small groups. The Comstock was unusual and will always be famous for the presence of silver as well as gold, and especially for the spectacular amount of wealth it generated. 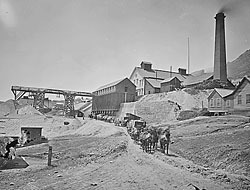 Miners retrieved what today would be billions of dollars in riches; the mines in and around Virginia City produced one-half of the nation's silver up until 1886. However, corporations were necessary to exploit a resource requiring an immense, complex infrastructure. This meant that only a few people ultimately benefited most from the Comstock mines, but that did not inhibit a worldwide fascination with the discovery. In addition, during the flush times money flowed freely and many enjoyed the prosperity. Unlike the small settlements throughout the California Gold Country, the Comstock District was a highly urbanized, industrial setting. Again, this was the model that all future mining developments generally followed. 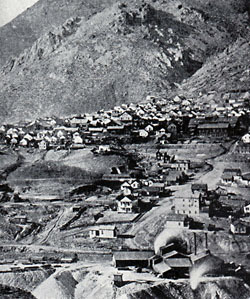 By the early 1870s, the mining district's capital, Virginia City, together with its smaller neighbor, Gold Hill, reached a population of nearly 25,000, becoming one of the nation's larger communities. Part of the 19th-century interest in the Comstock resulted from the millionaires it propelled into the international limelight. 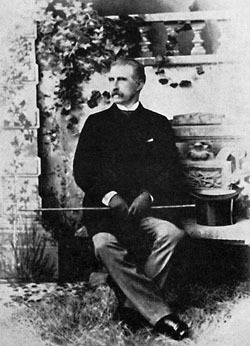 Wealthy men, from George Hearst and John Mackay to Adolph Sutro and William Ralston, made their fortunes while working or investing in the mines around Virginia City. The mines also spawned the successes of William Stewart, John P. Jones, William Sharon, and James Fair, each of whom served in the U.S. Senate. Much of the historical treatment of the Comstock has focused on the impressive technology, the immense wealth, and the men at the center of both. Nevertheless, Virginia City and its mining district were exceedingly complex, attracting immigrants from throughout the world. People from North, South and Central America, and from Europe, Asia and Africa came to the district, hoping to capture some of the success that had become a legend. For over a thousand Chinese immigrants, it was Yin Shan, the Silver Mountain. Irish miners from County Cork, on the other hand, typically saw Virginia City as a chance to sidestep the oppressive Appalachian coal mines in favor of a better place to work and a higher wage. Similarly, a modest number of Spanish-speaking people played an important role in the early development of the mining district. Samuel Clemens, who invented his Mark Twain persona while reporting for Virginia City's Territorial Enterprise, wrote, ".all the peoples of the earth had representative adventurers in Silver-land." Indeed, the mining district played a pivotal role in giving Nevada one of the largest percentages of foreign born in the nation throughout the 19th century. Still, over half of the Comstock's population was born in North America. The Northern Paiutes, living in the area for centuries before the arrival of others, possessed a culture and society that thousands of gold and silver seekers severely disrupted. Although they confronted oppressive prejudice and treatment, several hundred American Indians eventually settled around the mining district, and like others, they found various means to exploit the many opportunities of the new society. African Americans also came to the Comstock seeking wealth and opportunity. Many become prosperous, well-respected business owners. Thousands of Midwesterners, together with many New Englanders and fewer Southerners, added to the social diversity and complexity of the place. Together these diverse groups wove the rich tapestry that made the Comstock the crossroads of the world. Initially women were rare, but within a few years much of the gender gap had been bridged. By 1880, one third of the population was under 18 years of age, underscoring the fact that this had become more of a family-based community than a stereotypical mining boomtown. Mining camps throughout the world pass through an evolution of boom, dramatic growth and excitement, and then decline. The size and nature of each district's ore body define the duration of prosperity. The Comstock was remarkable both for the amount of wealth it produced and for the number of years it was able to thrive. By the early 1880s, it was becoming clear that the good times were over. It had been years since miners had discovered any new bonanzas, and thousands of people were leaving for better opportunities. 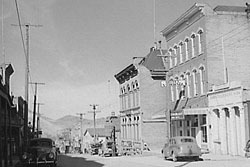 By the time of the Great Depression of the 1930s, Virginia City had declined, shrinking into a town of only several hundred people. These residents became custodians of a remarkable inheritance that included countless documents and photographs, hundreds of 19th-century buildings, and abandoned shafts and adits (an almost horizontal entrance to a mine). In addition, thousands of historic archeological sites are part of the rich heritage of a remarkable mining district, which the National Park Service recognizes as one of the larger National Historic Landmarks in the 50 states.